I often talk about the difficulties of being a victim of domestic violence. 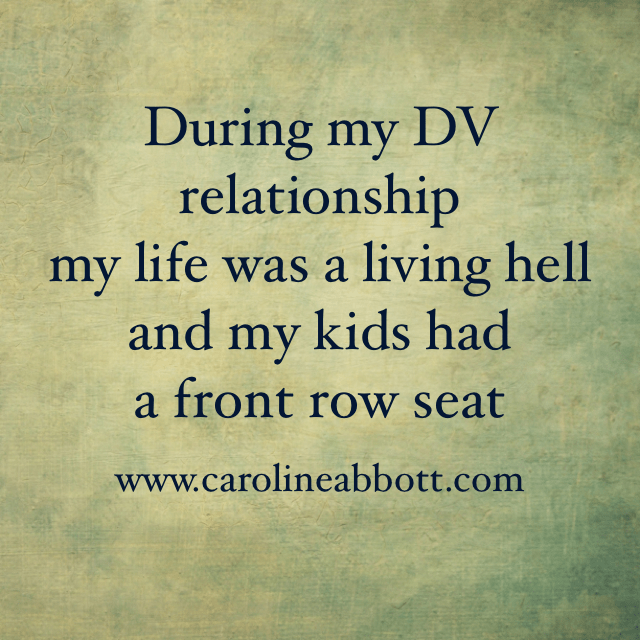 I’ve also talked about how detrimental DV is to the children in the family. But I haven’t said much about the pain of being a DV victim who is also a parent. Why do I make this distinction? I knew my marriage wasn’t healthy for me, or my kids. My abusive husband made my life a living hell, and my kids had a front row seat. [Tweet This] At the same time, I was from a divorced family, and I had promised myself I would never put my kids through the pain of divorce. I was torn between wanting my kids to understand the abuse happening in our home so they wouldn’t follow the bad example my husband and I were setting, but I also wanted to hide the abuse from them, so that they wouldn’t be scarred by it. I wanted to teach my kids how to respect their father, but his behavior wasn’t worthy of respect. Most days, he behaved worse than any child ever could, and caused more chaos in our home than all our kids combined. As a Christian woman, I wanted to submit to my husband, as I was taught in the bible, but my husband didn’t love me as Christ loves the church, (see Ephesians 5:21-33). Therefore, I couldn’t teach my daughters how I thought they should behave towards their future husbands, and how my sons should treat their future wives. I finally decided I needed to escape the marriage for my own physical, emotional, and spiritual health, but I was afraid of how my husband would behave if and when he had our kids to himself. Once I left the marriage, the paradoxes in my life didn’t go away, but that’s a story for another day. If you are a parent living in an abusive relationship, what are some of the paradoxes you must live as you try to survive from day to day?